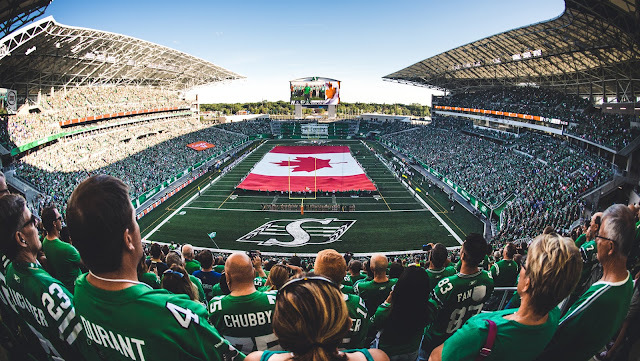 The Riders have a brand new stadium but the franchise and city will not host the Grey Cup next year, according to team radio play-by-play man Rod Pedersen. Pedersen Tweeted that Roughriders President Craig Reynolds revealed on 620 CKRM's SportsCage that the Riders did not bid on hosting the 2019 Grey Cup. Saskatchewan enjoyed a successful first season in 2017 at new Mosaic Stadium, which has a capacity of 33,000 but can be expanded for Grey Cup. Outside of the stadium, Evraz Place has worked well as the location for team parties under one roof and there’s room for indoor practices should that be needed. The thinking is that the Riders would prefer to have a couple of seasons under their belt in their new digs before taking on a Grey Cup. The host of the 2019 Grey Cup is expected to be revealed within a week's time. The 2018 Grey Cup will be played at Edmonton's Commonwealth Stadium. IMO, the Riders and the league have an agreement that the Riders do not have to bid on a Grey Cup to make extra profit that the other league teams so desperately need. Let the other lesser lights of the league who do not make the regular season profit the Riders make have that kick at the Grey Cup cash cow. Then why did the Riders host in 2013? Riders hosted it in 2013, if each team was provided an opportunity to host the Grey Cup then he Riders next turn would be 2022. There is a lot more that goes into it than a set schedule. Some teams don't want it cause it is an enormous amount of work or their stadium or facilities don't match up. Also most grey cups include some sort of government assistance so their has to be support at that level as well. And no, i don't believe the cfl has any kind of deal with the riders. Sure. Part of the deal is that the Riders never win a Cup or host a playoff so all the poor cousins can benefit from an extra game. There's always some great plot against the Riders. There was a time when the rich teams like the hated Eskimos paid equalization payments for the Riders to get by & didn't complain or lord it over teams like the Riders. All the Riders do is talk money all the time. Careful, your inferioty complex is showing - AGAIN. Not everybody's problem you're the little house on the prairie who wants to be the Mansion on the hill. You know what they say about New Money? "Sure" commenter - your basing your opinion on a mass generalization. Not ALL Rider fans feel the same as one persons opinion. Like any identifiable group, one cannot say each member feels the same way on all topics topics. Anonymous...Why don't you sign your name???? Are you really Who you say you are or are you Leonard Wilkins or Jim Rogers? If i was Brad Smith, would you know more about me? Wat'sit to U?